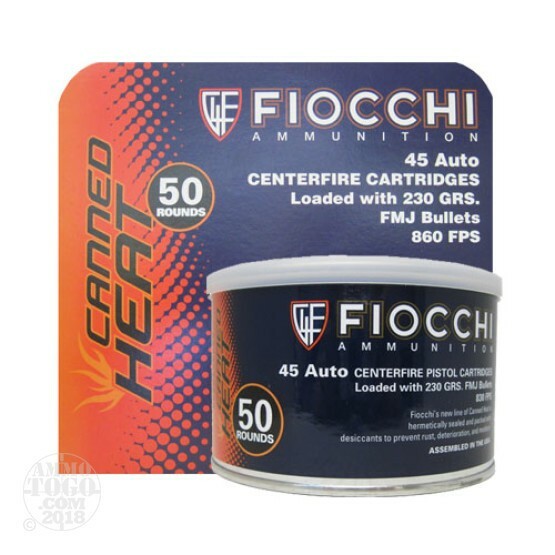 This is Fiocchi .45 ACP Canned Heat 230gr. Full Metal Jacket Ammo. Fiocchi's new line of Canned Heat is hermetically sealed and packed with desiccants to prevent rust, deterioration, and moisture. This ammo is manufactured by Fiocchi and is excellent quality ammo. This ammo is brass cased, boxer primed, non-corrosive and 100% new factory fresh. This is some excellent target ammo for the price. This ammo comes packed 50rd. cans.